The Travelstar 5K160 Upgrade Kit is actually Hitachi’s Travelstar 5K160 HTS541616J9SA00 2.5-inch SATA hard drive—which uses newer perpendicular magnetic recording (PMR) technology—combined with a USB 2.0 drive enclosure and backup software. Although not the largest laptop drive out there—in the short time since I received this kit, Fujitsu and Western Digital have announced 250GB laptop drives compatible with the MacBook Pro—the 5K160 is a nice upgrade for those whose MacBook Pro (or MacBook) shipped with a much smaller drive. Before you install the drive, you’ll need to copy the data from your original hard drive to the new one using the included USB drive enclosure. 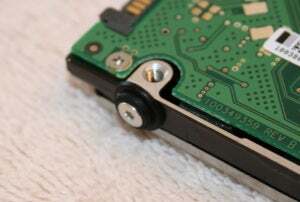 Putting the new drive in the enclosure—it doesn’t come pre-installed—is a simple process involving five Phillips screws, four to mount the drive in the enclosure and one to secure the case. The drive connects to your laptop using two USB cables, one for data and one for additional power. I’m a big fan of hard-drive kits that include such an enclosure, as it makes the process of copying your data before the swap much simpler (and faster)—otherwise, you’d need to use another Mac or a separate hard drive to temporarily host your data. And the enclosure lets you use your old hard drive for backups or other data storage afterwards. The Travelstar drive is initially formatted for Windows computers, so you need to use Disk Utility to format it as a “Mac OS Extended (Journaled)” volume. That task out of the way, you’ll want to make the new drive a clone —a bootable, mirror-image copy—of the old one. Although you can use Disk Utility’s Restore screen to do this, I personally used SuperDuper, my favorite cloning utility. 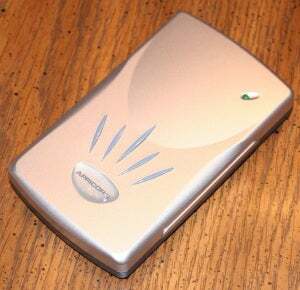 (The 5K160 Upgrade Kit includes backup software for this purpose, but the software is Windows-only.) 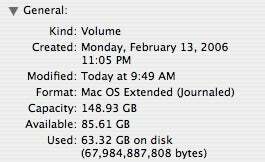 In my case, cloning my MacBook Pro’s built-in 100GB drive took roughly an hour and a half. The actual process of installing the new drive is the most difficult part of the upgrade. The MacBook Pro’s hard drive is not a user-installable part, so you won’t find instructions on Apple’s support site. And Hitachi doesn’t include computer-specific installation instructions. So I turned to iFixIt; specifically, the company’s printable guide to upgrading the hard drive on a Core Duo MacBook Pro. iFixIt’s guides are generally very good, explaining—and illustrating with color photos—every step down to the smallest screw. Well, almost: missing from this particular guide is any mention of two metal guides holding the MacBook Pro’s hard drive in place, along with four rubber-covered bolts on the drive (pictured at right) that hold the drive in those guides. But it was easy enough to figure out how to switch those bolts over to the new drive and fit the drive in the guides. In fact, thanks to the iFixIt guide, the entire process was fairly simple; if you’re comfortable with a screwdriver, you should be just fine. The scariest task—which occurs after removing most of the screws—is lifting off the upper case (the piece containing the keyboard); it feels like it might snap off in front, but some patient jiggling eventually convinces it to detach. A couple tips before you start: First, iFixIt’s guides tell you, right up front, what you’ll need (in this case, two screwdrivers—a very small Phillips and a Torx 6); make sure you have those tools or else you’ll find yourself running to the store mid-disassembly. Second, perhaps the most challenging part of the process is simply keeping track of all the screws; swapping the drive on the MacBook Pro involves nearly 30 of them. I recommend keeping a roll of office tape handy and using it to tape each screw to the particular photo illustrating when to remove it; when putting your MacBook Pro back together—you just follow the instructions in reverse—this will make it much easier to figure out which screw goes where. 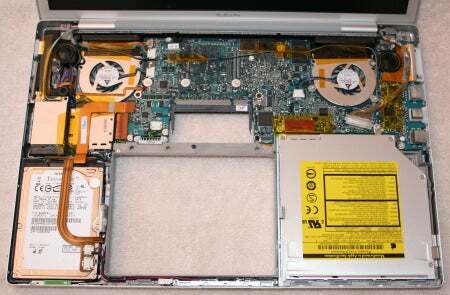 The insides of a MacBook Pro. Although I didn’t put the new drive through a comprehensive set of benchmarks, I did run some tests to get a rough idea of how it compared to my MacBook Pro’s original drive (a 100GB, 5400rpm Toshiba model installed when I purchased the laptop directly from Apple in April 2006). Before running any tests on the original drive, I backed it up, reformatted it, and restored it; this was to ensure that the drive would be just as un-fragmented as the new drive. Each test was performed on both the original drive before replacement and the new drive after replacement. To get a basic idea of each drive’s performance, I started with a folder containing 545 small image files, approximately 100MB in total size. Using the Finder, I duplicated that folder, created a .zip archive containing both the original and the copy (1090 files in all), and then un-archived the resulting archive. I timed this process three times and then averaged the times. To get an idea of how the new drive affected my MacBook Pro’s battery life, I created a Unix shell script that duplicates a large file (745MB, in this case), deletes the duplicate, and then repeats the process; the script basically reads from and writes to the disk continually until the battery dies. I performed this test while booted up normally; however, in order to ensure that neither test would be affected by screen brightness or wireless activity, I set Energy Saver to never sleep and never dim the screen, and I disabled AirPort and Bluetooth. The new drive was noticeably faster, yet used less power than the factory-installed 100GB model, which was itself supposed to be a bit faster than the stock 80GB drive included with most Core Duo MacBook Pros. The new Hitachi drive was also a bit quieter during use than the original drive. MacBook Pro temperatures with stock drive (left) and upgraded drive (right) after several hours of continuous disk and battery use. As you can see, the MacBook Pro’s temperature readings with the new drive were nearly the same as those taken with the old one. The differences were small enough that they could have been due to factors other than the new drive’s operation. Of course, the biggest benefit to upgrading to a drive such as this one is the additional storage space. Even my stock 100GB, cavernous in capacity compared to the notebook drives of just a few years ago, was getting dangerously full before testing this upgrade. Swapping that older drive for a 160GB model was almost luxurious—I could store much more music and video, and even had enough room left over to work with video from my DV camcorder in iMovie. On the other hand, this particular upgrade kit is relatively expensive. You can buy the drive itself as an OEM part for considerably less money; for example, NewEgg sells it for $115. And you can find a similar 2.5-inch USB/SATA external drive enclosure for $20 or less. Since the backup software included with the Upgrade Kit doesn’t work with Macs, going this route will save you over $70. The drawback is that the Upgrade Kit provides a three-year warranty on the drive as compared to the one-year coverage included with the OEM version. Another option is Mac-friendly MCE Technologies, which sells a $139 upgrade kit that includes the same Hitachi drive (or a similar Samsung model), a USB drive enclosure, a one-year warranty, tools, and notebook-specific installation instructions. Regardless of which approach you take, the Hitachi drive itself is a good one for upgrading your MacBook Pro (or MacBook, for that matter). If you’re running low on storage space, this drive offers impressive capacity, as well as better performance and lower power consumption than the stock drive.